Wembley National Stadium Ltd. (WNSL), or ‘Wembley’ to you and me, is teaming up with UK mobile network operator EE in a six-year deal that they hope will make the stadium ‘the most connected in the world’. The multi-million pound deal comes into play with immediate effect, with the first event taking place on March 2 – the Capital One Cup Final. Though the real fruits of this tie-up won’t be seen for a while yet, EE customers will start benefiting from “exclusive ticketing and marketing initiatives” from late March. 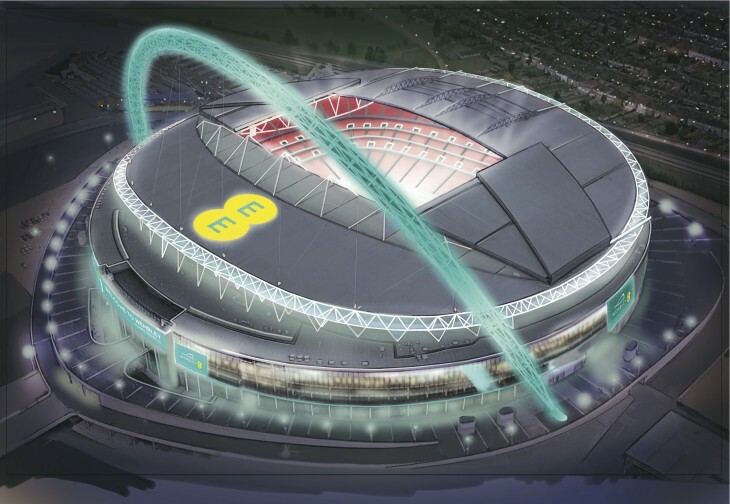 Although EE will be a lead brand and sponsor, the Wembley Stadium name shall remain. This is certainly a good move, given that corporations putting their own name into traditional, long-established sporting brands typically doesn’t go down well with fans. But there is a new composite logo, and EE will become a supplier to the England Men’s Senior Team (football) and The FA Cup competition. The deal will see some interesting initiates comes to fruition over the next six years. The so-called ‘technology roadmap’ will herald ‘enhanced’ 4G coverage, superfast WiFi and mobile payments integrated across the stadium. As anyone who has tried using their mobile phones within busy sporting arenas will attest to, perennial 3G issues in and around the stadium due to the mass concentration of mobile phones often restricts what fans can actually do with their devices. So this move will be good news for fans. The deal also includes the launch of a new co-branded mobile app for Android and iOS, which displays the latest events, the view from your (potential) seat, a travel planner and even a ticket-buying feature. Launched in 1923, Wembley Stadium is probably best known as the home of England’s national football team, but it’s also used for cup competitions (including the FA Cup Final) and concerts. The original stadium was demolished in 2000, and was replaced by a 90,000-seater behemoth which opened in 2007. While we’re starting to see more stadiums go ‘connected’, we’re still in the early stages of a widespread transition. League Two’s Wycombe Wanderers has been offering WiFi for a while already, while Liverpool FC announced its own intentions last April. Elsewhere in Europe, Real Madrid has been making in-roads on the hi-tech stadia front, as is Barcelona, but WiFi is still a relatively rare beast in the European soccer scene.